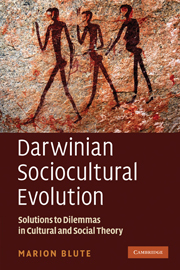 The text of Darwinian Sociocultural Evolution: Solutions to Dilemmas in Cultural and Social Theory went in at the end of March 2009, so it was almost a year before it was published. I would not change the thesis of the whole nor of each chapter today, but new material continues to come out which I would like to comment on in an informal context, while also posting about more general evolutionary issues. For example, remarkable empirical results in sociocultural phylogenetics continued to be produced in 2009. Gray Drummond and Greenhill, extending an earlier analysis, applied Bayesian phylogenetic methods [gated] to 210 lexical items of 120 languages to shed light on the peopling of the Pacific. Their analysis concluded that the evolution of Austronesian languages was closely coupled with the geographic expansion of people and proceeded in a series of pulses interrupted by pauses originating in modern day Taiwan around 5,230 years ago and ending eventually in New Zealand between 1200 and 1800 years ago. They hypothesize that the pulses were the result of technological inventions, originally the outrigger canoe. In related work, Jordan, Grey, Greenhill and Mace matched ethnographic data for 135 of these societies and with the same 210 lexical items and were able to infer that matrilocal rather than patrilocal or ambilocal post-marital residence was the original ancestral state of these societies. Finally, Rogers, Feldman and Ehrlich developed a method for identifying historical sequences in cultural data even in the presence of horizontal exchange and applying it to a set of data on Polynesian canoe design traits, they were able to infer Fiji as the ancestral homeland of these traits, that cultural distance increased with geographic distance, and that there was a serial founder effect of declining diversity with distance culturally just as there normally is genetically. It is remarkable that these three studies show that applications of methods originating in biology can be used to reconstruct ancestral states and infer details of human cultural history across 5,000 years – linguistic in the first case, social organizational in the second and technological in the third. Knowledge across five thousand years may not seems like much to a paleontologist, a paleoanthropologist or even an archaeologist but to cultural anthropologists and sociologists it is remarkable.